We had a blast filming this piece at Walt Disney World. Today in 1983, the motion picture “Vacation” was released in theaters. In the film, Clark Griswold tried to create the perfect family trip. Traveling cross-country to the fictional Walley World, he and his family hit the road to see the nation in a Wagon Queen Family Truckster car. The motion picture went on to become a classic and the car became an iconic part of the film. 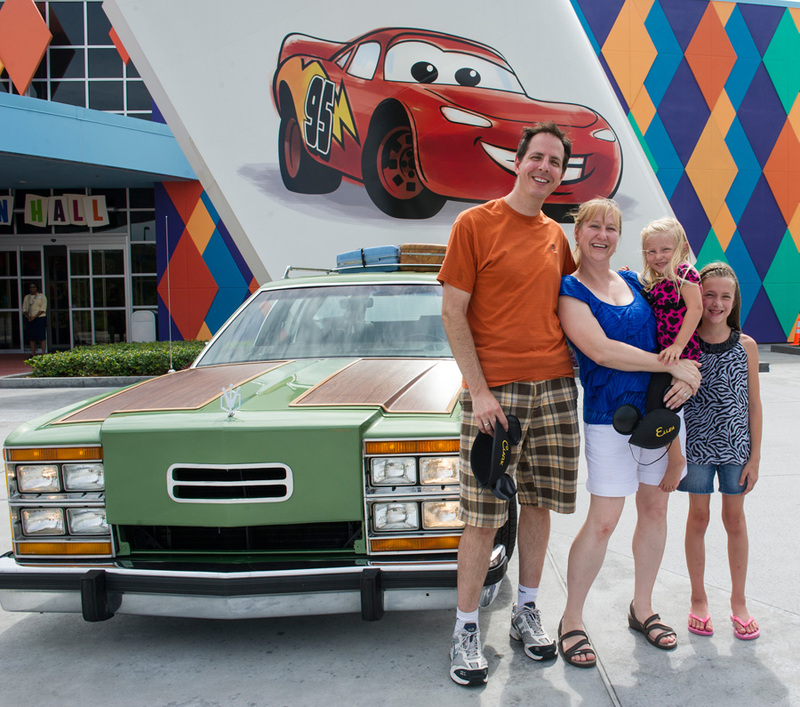 Fast-forward to 2013, and a real-life family of Griswolds — Steve and Lisa Griswold, and their two daughters, Amber and Brooke — hopped into a custom-made Wagon Queen Family Truckster and drove from their home in Canton, Georgia, to Walt Disney World Resort. Visiting Walt Disney World Resort on the 30th anniversary of the famous film? That’s definitely something that would even make Marty Moose proud. The custom car is only about 2 weeks old and this is the first vacation the family has taken in it. What was formerly a brown station wagon was transformed by a car shop in Georgia with new wood-panel siding and a new “metallic pea” color (the exact hue described in the film) paint job. Steve then added special touches like custom-made gold crown symbols on the side of the car, the signature, silver crown hood ornament and even a (faux) fuel tank door on the hood. (Be sure to take a look at the photo gallery to see more.) He also added a few modern conveniences, including DVD players (which were loaded with the “Vacation” film when we visited) and Bluetooth wireless technology. After putting some vintage luggage that he purchased online atop the luggage rack, the Griswolds were ready to hit the “holiday road” to Walt Disney World Resort. Steve and Lisa, who own and operate a travel agency in Georgia, are no strangers to Walt Disney World Resort. They are both former Walt Disney World College Program participants and former cast members. They visit quite often with their daughters and have sailed on all four Disney Cruise Line ships. This first interview is with our friend Scott Fias from Channel 9 CNN in Orlando Florida. A very nice piece that shows off the Griswold Family Truckster and some fun driving shots. We had a blast filming this piece and also the Disney media piece. This was a Live interview with NBC 11 Alive Atlanta morning show. Brooke (3) was pretty excited when she saw herself on TV during this live interview. This was super cute. The NOW, a great take on our Griswold road trip from MSN News. Pretty funny! We won CNN’s Video of the day award! We met up with NBC, ICN, CCTV, at the Big Texan to film a reality show “Explore Route 66” on our road trip to Walley World in CA. If you have a quick deadline you can grab some photos for your news story from here.